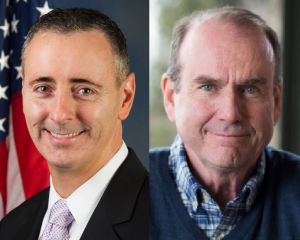 The New York Times/Siena College completed another live poll for the race in the 1st Congressional District between incumbent Rep. Brian Fitzpatrick (R-Bucks) and Democrat Scott Wallace. Their live poll shows Fitzpatrick leading Wallace 47-46 with 502 people responding after 29,261 calls were made. The New York Times describes it as a “close race”, which shows significant differences from their polling conducted just two weeks ago that had Wallace holding a “modest” 7 point lead. This poll was conducted from Oct. 26 to Oct. 29. The margin of error for this poll is +/- 4.7%. This poll shows substantial gains in Fitzpatrick’s favor compared to their previous poll, but none more notable than his change in favorability rating. 53% view Fitzpatrick favorably, 36% view him unfavorably, while 11% don’t know. This brings the Republican incumbent’s net favorability rating at +17%, while the previous poll had his net favorability at +6%. Their poll conducted from Oct. 11-14 had Fitzpatrick holding a 43% favorable view among those polled, while 37$ viewed him unfavorably and 20% say they didn’t know. The new poll shows Wallace made increases in both favorability rating and unfavorability rating, while those who say they didn’t know him made a 14% decline. 46% view Wallace favorably, 39% view him unfavorably, while 15% don’t know. In the previous poll, Wallace held a slightly better net favorability rating of +9%, in comparison to the current +7%. The poll from two weeks ago showed Wallace holding a 40% favorable rating, with 31% viewing him unfavorably, and 29% saying they don’t know. 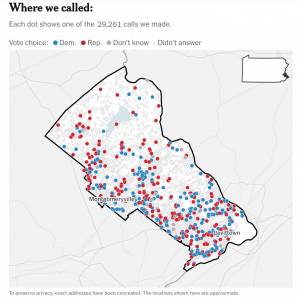 The New York Times dubbed this suburban Philadelphia district as a “classic battleground in presidential elections and it ought to be one of the top Democratic pickup opportunities in the country.” The newly drawn district slightly favored Sec. Hillary Clinton over President Donald Trump in 2016, while voters still overall hold a net negative view of the President’s job performance. 47% approve of President Trump’s job performance, while 49% disapprove, and 4% say they don’t know. This is also a considerable jump in the Republicans favor compared to the previous poll two weeks ago that showed only 42% approving of Trump’s job performance, with 53% disapproving and 5% who said they didn’t know. Voters polled also still prefer the Democrats to retain control of Congress, although this shows a 10 point swing away from their direction compared to the previous poll. 49% polled want the Democrats to regain control of the House of Representatives, while 44% want the Republicans to remain in the majority, with 7% saying they don’t know. The poll conducted from Oct. 11 to 14 had 55% wanting the Democrats to regain control of the House, while 40% preferred Republicans to maintain their majority and 5% saying they don’t know. As an aside, our polls of PA-1 and NJ-3 both went from being big Dem outlier-ish results to <1 pt GOP leads. If the Dems win, I fully intend to say you should have taken the average. Nate Cohn, who covers elections, polling, and demographics for the New York Times, acknowledged the differences from the previous poll in a tweet, stating his belief that, “If Dems win, I fully intend to say you should have taken the average” between the two polls. Another difference from the previous poll was that they did not ask if they’d like to have their Congressional representative serve as a check on the Trump agenda. In the previous poll, 59% polled said they wanted their Congressional representative to serve as a check on the Trump agenda, while just 35% wanted their representative to support his agenda, and 6% said they didn’t know. I actually disagree that he is a bad candidate. The R pacs have gone all in and spent a literal fortune to save this seat. Still, we have to see what happens next week. I do agree that negative ads work. These are some of the worse I have ever seen and grossly distort the truth. I see Fitz winning a close race. Dan David is going to surprise in PA-04. Not a chance. Not even a little bit. Especially after last week. Even before then, no shot. I know they went scorched earth but unlike PA 1 there are forces in play in 4 that actually work against that. I shouldn’t have to explain why.